Yesterday, The Cruise Examiner disembarked from a 7-night Mediterranean cruise in Marseilles from Croisières de France’s new 46,811-ton Horizon. He files his report herewith. 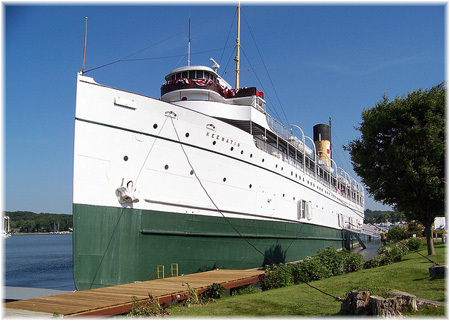 Last week, after forty-five years as a stationary maritime museum at Douglas, Michigan, the last Edwardian era overnight steamship left Douglas, Michigan. For a ship of her age, built as she was by Meyer Werft in 1990 as the first newbuilding for Celebrity Cruises, the Horizon is in remarkably good shape for her twenty-two years. The condition of her hull and her general maintenance are quite impressive. The quality of the furnishings and fittings are of a high standard and in general, built when she was and for who she was, her staterooms are quite spacious and her convertible king/twin beds quite large and very comfortable. Croisières de France have acquired a good ship, and it is to be hoped that the line’s recent marketing efforts under new ceo Antoine Lacarrière, using television advertising, posters in the Paris Métro and a contract with Thomas Cook France will eventually result in the addition of the Zenith to the French cruising fleet. The objective is to exceed 60,000 passengers this year with Horizon. In general, its new ship has a substantially higher capacity than the 37,301-ton Bleu de France that she replaces (1,506 lower berths as compared to 752 on Bleu de France), which has meant that Croisières de France has been able to lower its lead-in prices quite significantly. Unfortunately this shows in the crowding one experiences in some areas on board Horizon compared to her much roomier predecessor. This crowding is largely because twenty-two new staterooms replaced what was once the ship’s America’s Cup Bar on deck 11, and accordingly forty-four more places (22 in each of two sittings) had to be added in the main restaurant without any expansion, which has caused some table crowding. In some areas, it is also impossible to escape the noise of speakers broadcasting music, and this is particularly true of the outdoor lido at the aft end of deck 11. This is an attractive upper deck area aft of the buffet, much larger in fact than similar areas on the two Crystal ships or the line’s sister company Azamara Club Cruises, on which ships one can find relative tranquility. The music in the Horizon’s aft lido needs to be turned off, or at least the volume turned down. Other than the noise, the lido area is set off as it supplies large linen napkins along with the usual utensils, and the food is good and varied. Noise is pervasive however and perhaps Croisères de France should examine this, particularly on a higher density ship than Bleu de France. At times there is a lot of noise around the pool on deck 11, especially when the animators are running bingo there before dinner. Trying to move aft, one encounters either the funnel exhausts on the open decks on deck 12 or loud blowers in the middle of the aft tiered decks 9 and 10, which do however feature attractive wicker seating in the wings. In general, the employment of nine animators on a ship like this is probably six too many. Adults are not children and these animators (also used on Pullmantur, Costa and MSC ships) tend to create an atmosphere that is more like a camp than a cruise. If one tries to escape them on the promenade deck that wraps around both sides of the ship and the aft end of deck 8 one will find no chairs (probably because the sides have to be kept free for the type of Schat davits used) where Bleu de France had proper steamer chairs. Croisières de France’s clientèle are in general middle-aged and up from the French middle classes (this is a 100% Francophone product), without too many children (most of those are attracted to MSC’s kids travel free promotions), and not too many very old people either. The crowd is thus somewhat lively and keeps all the bars, lounges and the Moka café humming all day. This ship’s most important shortcoming is probably the lack of a quiet lounge where on can have a drink and a conversation in relative piece. As the entertainment is presently arranged, it is necessary to move from lounge to lounge to avoid being assaulted by loud music. The sole possible exception is the James extra tariff piano bar, but even there it is a small room and the piano can be quite loud. Service in general is quite good and staff are for the most part friendly, but in the main restaurant, possibly because the waiters are as crowded as the passengers, service can be somewhat bumpy, and sometimes quite literally. All in all, however, at fares like those charged by Croisières de France for an all-inclusive voyage, one certainly gets what one pays for. The food, although somewhat salty, is by Paris chef Francis Léveque, and improved over our cruise. After forty-five years as a stationary maritime museum at Douglas, Michigan, the last Edwardian era overnight steamship left Douglas, Michigan, last Thursday around 2 pm to commence her return voyage under tow to her last home port of Port McNicoll, Ontario, on Georgian Bay. This 105-year-old former Canadian Pacific steamship will be renovated to become the centre of a new $1 billion resort community at Port McNicoll. The Saugatuck-Douglas Visitors Bureau recorded her departure and it was watched live by 17,400 people worldwide. The Keewatin will soon head off under tow to Mackinaw City, Michigan, where she will lay over in preparation for her final tow to Port McNicoll, where she is due to arrive at 2 pm on Saturday, June 23, one hundred years to the day since her first passenger departure from that port in 1912.